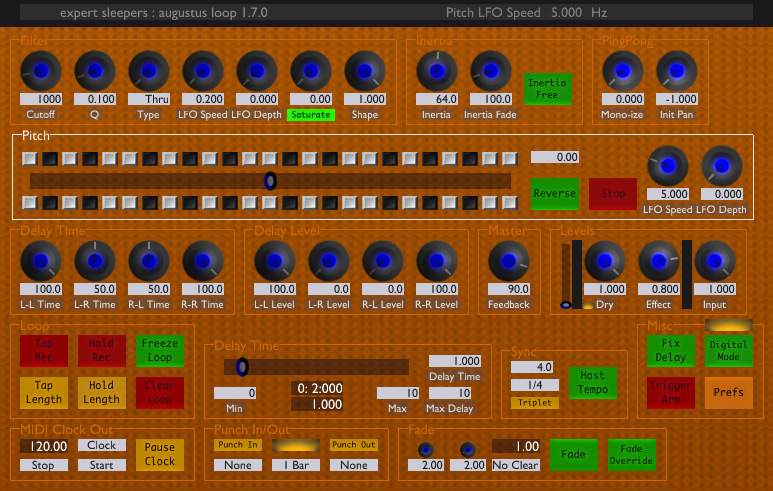 Augustus Loop by Expert Sleepers is a Virtual Effect Audio Plugin. It functions as a VST Plugin, an Audio Units Plugin and an AAX Plugin. Mac 64-Bit version is AU Intel only for OS X 10.5 and above. Really long maximum delay (3600 seconds - that's one hour). Tap length/tap record. You can set the loop delay time while recording your first phrase. Change the tape speed (i.e. pitch up and down). Smoothly change the delay time (as if you were changing the head gap on a tape delay). Multimode filter and saturation in the feedback loop. Four feedback taps (left to left, left to right, right to left and right to right) with independent delay time and feedback settings, for ping-pong effects, stereo delays, etc. Loop length can be set in terms of the host's tempo setting. The plug-in can output MIDI clock messages to synchronise other applications to its loop. Automatic fades up and down to allow smooth transitions in your playing. It can even automatically clear the loop for you once it's faded out. Host transport-sync'd punch in and out when recording. 'Inertia free' mode suppresses the tape-like behaviour when changing delay times to allow seamless transitions between loop lengths (This is also the route to the popular 'multiply' and 'divide' features found on some popular looping devices). I have been a fan of Loopers hard and soft since the days of the original Lexicon JamMan and the Oberheim EchoPlex Digital Pro. I recently fired up Augustus Loop on an Apple laptop and used it in a live concert. Augustus Loop and it's tape machine paradigm is simply put a ton of sonic fun! I am excited to get deeper into the MIDI.Lua scripting...without a doubt this will really open up the creative live looping potential of AL! Once I started to get the hang of AL I found it to be really smooth and silky sounding or quite edgy and quirky as well. 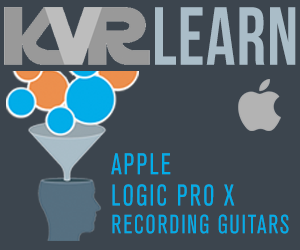 Augustus Loop is one of those must-have sleeper plugins that if it's not in your arsenal of looping and delay tools you owe it to your looping endeavors to cop it. I have had it since before version 1.5 and it is only recently that I have started to really tap into the wonderful possibilities it presents. I have been working with Augustus Loop controlling it with an FCB1010 with the UNO firmware and the FCBUnOControlCenter editor for OS X and this Laptop Live Looper dream of mine is starting to work as intended (after about 14 years or so)! Thanks to os and Expert Sleepers for Augustus Loop and their complete line of excellent software and hardware tools. I use AL a lot and love it. I only wish that looking at it didn't make me feel quite so queasy!! It is one UGLY plugin. Sound and function obviously trump looks though, and here it shines :-) I've set up a looping rack using AL and Ableton Push. Lots of fun!.